We have two full cycles of Legendary creatures in this set, both at rare and not mythic. They are aligned with two- or three- color combinations, and for casual play, there are notable implications. Let’s start with the best of all: Dragons! There are five two-color legendary Dragons in this set, and they all grant a bonus to attacking Dragons. Naturally, this means we want a Dragon-themed deck! I would imagine that most people reading this would have built a Dragon deck at some point, either a casual 60-card one or an EDH deck or something. I know I had a stack of Revised Shivan Dragons! 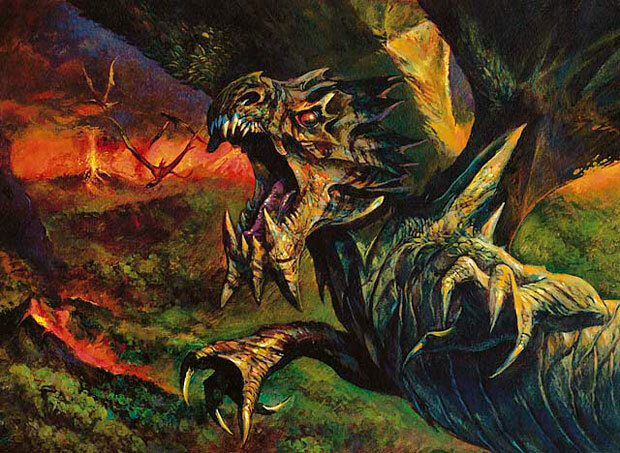 Fate Reforged has common Dragons, and a significant number of uncommon one. We get only our third mono-green Dragon too! The next set is named Dragons of Tarkir, indicating that we’ll get a few big flyers there as well. What does this mean? We’re looking for cards that play well with Dragons. We’re looking for cards that enable casual Dragon strategies, or that synthesize well with the tribe. Our first contestant is Dragonspeaker Shaman. I will be surprised if this card isn’t reprinted sometime this block. It’s already had three printings and it is at $5, but its only foil is at $8. I really like picking up the old-border foils right now, because if there’s a new version that comes out, the older, different foil will be a bit more sought after. It’s interesting that despite being in two supplementary products, this price is still so high for non-foils. It’s barely second place behind Knight of the Reliquary in the Duel Deck! I’d expect the price of nonfoils to fall if it is added to Standard, though. Dragon Roost, as a source of Dragon tokens that doesn’t die to creature removal, could be a fun target. Even foils are under $5, but it’s got two versions to choose from. Utvara Hellkite is creeping upward. It’s a mythic in a very popular set, but it’s ridiculously good in multiples and if there’s one thing casual players like, it’s winning with more and more Dragon tokens. Another card I’m intrigued by is Crucible of Fire. It’s a super-cheap pickup right now, and please don’t overlook how many people build 60-card casual decks. Commander is not the only casual format, and Crucible is outstanding in multiples. I would be content to get a stack of Crucible for under fifty cents, and just wait. Dragonstorm is also appealingly cheap right now. It’s got multiple foil versions to choose from, and the new rare Dragons really like dumping a lot of Dragons into play. I wouldn’t mind having a few more of these, even if they cost nine to cast! The cards I’m most excited about, though, are a set of Mirage legends that are now on the Reserved List: Hivis of the Scale, Rashida Scalebane, and Zirilan of the Claw. The first two are under fifty cents, and Zirilan is up to nearly $2 because he’s amazing in a Commander deck. These are not going to get reprinted, and they interact amazingly well when casual games have lots of Dragons. One is a Soldier that kills Dragons, one steals others’ Dragons, and the other grabs Dragon after Dragon out of your deck and fills your graveyard. As cards that Wizards won’t reprint and rares from a set released nearly eighteen years ago, these are excellent candidates for a spike. I don’t like moving in on Kargan Dragonlord or Dragonmaster Outcast right now. The price is already high and a reprint of either mythic would be disastrous for their prices. They are fun cards, don’t get me wrong, but I don’t condone picking them up, even if a reprint of a Level Up creature is unlikely right now. Something else I’m not high on is the pair of Dragon legends, Karrthus, Tyrant of Jund and Scion of the Ur-Dragon. I am aware that these are not the only choices for a Commander, but they are possibly the best. Karrthus is in the main Dragon colors and gives theft and haste, while Scion is the only five-color choice…for now. Scion being a $50 foil reflects the popularity of having the five-color deck. I don’t see a lot of growth for the foil, but if you wanted to pick up nonfoil Scion at around $2, that’s pretty safe and might be a fun thing to trade to someone about to build their first Dragon-themed deck. It bears repeating that Commander and R & D are closely linked. Members of the Commander Rules Committee work at Wizards. The things that players want to have, Wizards wants to give. I would call it unlikely that we’ll get a set called Dragons of Tarkir without getting a new five-color Legend, but I’ve been wrong before. Unfortunately, Zirilan of the Claw says exile, not sacrifice. Hey not to be a stickler but Zirilan of the Claw doesn’t allow the dragons to hit the graveyard. And that was already mentioned. How dare I.